Thats cool, how did you do that before and after sliding? Interesting and nice tutorial. The final results look blurry and very fake. Interesting tutorial thank you. What is the point of creating the flaws layer if you will be removing all the wrinkles and airbrushing later? Is it not redundant? Thank you for the tip. As a beginner these type of video helps new jacks understand what PS has to offer. As a follow beginner I have to ask you how the hell those something that’s end product looks fake be off any value? Your voice sounds so good!! You cannot simplify the steps into a 10 minute video with shortcuts. High end retouching is an ART that takes years to master. I spend at least 2 hours per photo and I know that you cannot retouch it in 10 minutes. You might think that your doing the world a favor with this video, but you are only springing up more faux-retouchers who dilute the jobs and put the real beauty & fashion retouchers out of business. Sorry but I don’t think any “faux retouchers” can actually put you out of business. I know that sounds harsh but if you’re really that good, then you wouldn’t be effected by them. Hi I’m only starting to learn photoshop and can only do the basics of the basics for really slow and stup beginners. Enough of me I don’t know much but I can see from a mile away the end product looks fake so sorry but a quick short cut ten minute so called tutorial are useless if the end product looks fake. Btw I didn’t even try this tutorail because I want to learn about photoshopping that’s end product looks like the real deal and not supper doeper fake! I can only agree with you! This is, i’m sorry – but horrible. The goal within ‘high-end retouching’ is to make the skin look ‘perfect’, if there is such a thing. This tutorial (i didn’t even look thru it, saw the ‘result’ which was enough) isn’t going to help anyone. Using the old ‘Gaussian Blur’-retouch method would be adviced before using this tutorial, and the ‘Gaussian Blur’ method is somewhat.. bad. I’m not just going to complain, as it will serve no purpose at all. Instead, i wan’t to help you out, to become better. So, my advice, google for ‘Dodge and burn’. 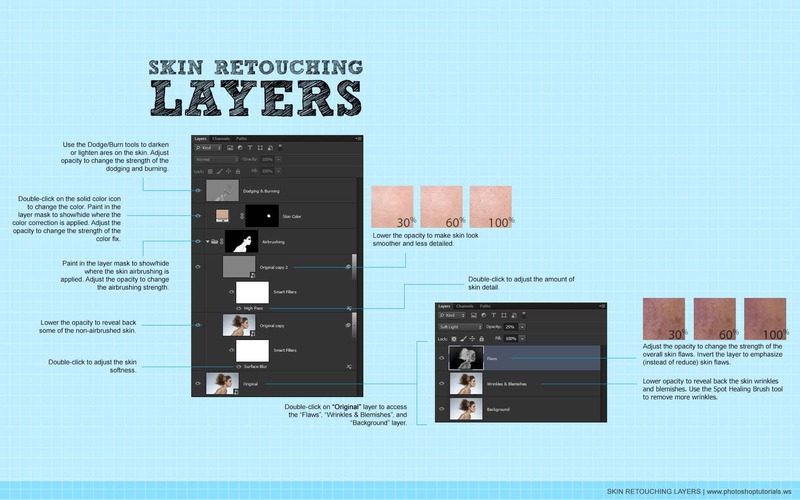 That’s the method we use when retouching for magazines or w/e. It takes time, just like Valen says. Some images can take more than 2 hours. In reply to Valen: I am a full-time professional fashion and editorial photographer and I agree with you that it is possible to spend hours on a photo. But you should not discredit this tutorial in that manner. I have read through this tutorial thoroughly and watched the video and I have nothing but compliments for the author. The video was outstanding and the author has the best voice and clear instructions. If the instructions are in question, then my suggestion is to try it out for yourself. I know many of these techniques already. It is the basic high and low pass retouching that “every” professional retouching artist use. They briefly go through dodging and burning too. But the video is fast-forwarded. I think they should teach more about dodging and burning but it is hard to describe because every photo is different. In reply to Nick: Your comment doesn’t make sense. Maybe you didn’t see the next page? The last photo on this page is blurry but it is not the final image. Click on Page 2 to see the results. There is “no” gaussian blur used here. Dodging and burning is taught here too. There is a Next Page button which you should click.